Somewhere/sometime along the way, people got ugly with the comments on Facebook: attacking each others' political, religious or fashion beliefs. I tried to play nice and ignore the barbed comments. I "unfriended" a few people who disregarded general rules of being a good human being. I hit the "hide" button for many people who were generally mean-spirited with posts or comments, but kept them on the friend role for acting/business contacts, which made me feel hypocritical and a tad smarmy. Facebook evolved into a aggressive marketplace with ads and sales pitches everywhere. Online retailers would ask if I wanted to post purchases to my Facebook wall or profile. No, Big Brother, I don't want to publicize what I'm buying, but thanks for asking. Now Facebook banners pop up on nearly every website I visit, asking me to click the "like" button and post whatever I'm reading or shopping to my Facebook profile. Again, no thanks, Big Brother. The creepy straw that broke the Big Brother camel's back occurred when a large window showed up on my Facebook page a few days ago asking me to "become a fan" of over 150 different bands, TV shows, retailers, nonprofit groups, etc... that I had ever mentioned on Facebook. Wow, there's an app for tracking everything! I know that being online in general, and especially writing a blog, opens me up to security risks and scrutiny. That's life in the virtual and literal world. However, to have Facebook so aggressively trolling my personal information across not just Facebook, but the internet as a whole, and wanting to make that information public in perpetuity, trumps all sense of privacy (however deluded in this digital era) and security. I wanted a fun social networking website, which Facebook initially delivered. Now it's work to manage my online personae, protect my privacy, manage different friend lists and try to remove tags from unflattering photos. No thanks, Big Brother. After every vacation or trip away from Austin, I'm happy to get home. I like vacations and traveling to experience new cultures and sights, but I LOVE Austin. Typically the first stop after baggage claim upon returning to Austin is a meal at Chuy's on Barton Springs Road. Later at home as Chad and I cuddle pets and unpack bags, we start a verbal & mental list of all the fun Austin things we want to do. After an audition in South Austin last week I hightailed it to South Congress Avenue, also known as SoCo. I treated myself to solitary shopping and slow browsing at Tesoros and Crofts Originals. I window-shopped at every store on my path with no fear of being a human traffic impediment. I ate a late leisurely lunch at Home Slice pizza. Exploring SoHo in Manhattan was fun, but daunting with the whipping cold winds and crowds. Hanging around SoCo in Austin offered a charming blend of familiarity, lovely weather and slow-your-roll-speed. Other items on last week's fun-to-do list included planting tomatoes and herbs, weeding planting areas - which may not sound fun, but are fun for me. We went to the Hatch Show Print exhibit at Austin Museum of Art. I loved seeing these letterpress prints! This old fashioned method of printing produces a richness and individuality for each print that modern methods fail to deliver. Go see this exhibit for yourself! While we had claim to a great parking space on Congress Avenue, we dined at Annie's for the first time. Chad had the mussels which I don't eat, but he liked them. I had a green salad with lemon zest and goat cheese which tasted wonderful in its simplicity and gave me a semi-healthy feeling. We shared espresso creme brulee for dessert - not so healthy, but super-delicious. The restaurant had the front french doors open. We basked in the beautiful weather and mild breeze as we watched hot rods motor up and down Congress Avenue, no doubt part of the hot rod events last weekend. Chad educated me on the term "rustoration", which refers to many of cars we saw that had shiny chrome and lovingly refurbished interiors with rusty exterior panels. Saturday we went to a friend's birthday party for an outdoor viewing of Jurassic Park complete with typical yummy movie snacks and the above-typical snow cones! I loved seeing friends and reconnecting with some of Chad's former coworker-friends while learning the origin of the timeless cinematic quote, "Hold onto your butts!" Next up on the hooray-we're-home-to-do-list: plant more stuff, trek up Mount Bonnell to ogle the rich people's houses, tour the fine snow cone stands in town, go swimming at Deep Eddy Pool, spend more time with friends, cuddle the pets more. Apologies for the delay in posting. I know you guys waited in suspense to read about our last day and a half in New York, which as foreshadowed in this post's title featured even heavier rains that did not stop politely as we went about our sightseeing. First stop on the day's subway travels was at Macy's Herald Square for the Flower Show. The rain kept us from enjoying the outdoors, but Macy's put a zillion beautiful plants and flowers indoors for us to ogle. 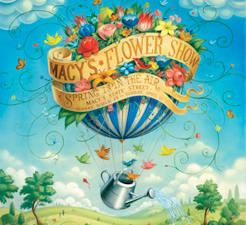 From the Macy's website, "Spring Is In The Air as Macy's Herald Square is transformed into a wonderland of spectacular gardens where magic reaches new heights and floral fantasies take flight! This year's show features 10 different garden environments, including our new Hot, Palm and Topiary gardens, and over 30,000 different varieties of exotic trees, flowering plants and brilliant color as far as the eye can see. Take a guided tour or stroll through our enchanting gardens at your own pace. And, don't miss our hot air balloon centerpiece, overflowing with lush spring flowers that will make your spirits soar!" I wish we had taken photos, but we didn't. In a word, it was LUSH. What a wonderful break from the dirty rain outside. Next stop on the R train was the Union Square Whole Foods. Chad and I both craved vegetables. In general, Manhattan lacks fresh produce in the worst way. Whole Foods supplied a welcome oasis of nutrition at the salad bar. Mmm... vitamins. Due to the rain, Chad and I opted not to trek over to ABC Carpet & Home, but on past trips to the city, I loved visiting ABC. We chose to lounge in the loud, crowded Ace Hotel lobby for a while before dinner. Other people may have braved the rain to see more sights, but we didn't. Vacation is a time for relaxing, so that's what we did until dinner. In the dusty drizzle, we returned to Toon Thai on Park Avenue. Yum again! Our after dinner stroll (in the rain) took us to the Empire State Building to peer at the architecture. Due to the rain and clouds, we did not go up to the observation deck. Chad loves Pinkberry. We were within walking distance of one, so we had to go. It was my first taste of Pinkberry. It's frozen yogurt that actually tastes like yogurt versus tasting like watered-down soft-serve. Pinkberry also offers a variety of toppings from chocolate chips to fresh fruit. Tasty in a healthy-ish way. Back through the rain, past the lobby bouncers to our hotel to pack for our trip home the next morning. I was more than ready to get home to beautiful Austin, my cozy & good-smelling house and my sweet pets. But first we took a harrowing cab ride to JFK airport. The cab driver had a little conniption fit about the rain and traffic, scolding us that he wasn't making good money by driving us to the airport. Sorry, dude, but please quit trying to commit vehicular suicide while we're in your cab! The truly scary ride included a meandering (methinks also lost & frustrated) tour of the parking area before dropping us at our terminal. Kiss the ground! We made it to the airport in one piece! Reliable, comfortable JetBlue got us home seven minutes early! While I enjoyed some aspects of the trip, I'm thankful that we did not move to New York City when we had the chance. I truly love Austin. Sometimes you have to get away from home to break the chains of daily chores/work, but Austin has everything I need and love. True, the weather did not cooperate with our vacation plans, but I think I've seen all of New York City I need to see. Done. Check. Next. If I get my way, our next vacation will be somewhere lazy with nature versus a bustling city. Our third full day in New York started with a long line for coffee at Stumptown. While the coffee met our caffeine needs deliciously, Stumptown's pastry supply was seriously depleted by the early birds. You would think it would be easy to find a bagel in Manhattan, but we walked at least six blocks in the rain, popping in & out of four shops before we found a place that had bagels. As we noshed and watched the rain continue, we not so enthusiastically plotted our subway course to Central Park. Yeah, in the rain. As previously mentioned, I learned to like the subway. This subway trip to Central Park would require two different trains. We took the first train with ease up to Port Authority. Then we walked deeper and deeper into the bowels of the subway system to catch our second train. I was feeling a touch skittish about going further underground, but we found our platform only to spy printed memos stating that the C train would be out of service for several days. The memo helpfully directed travelers to other trains for different destinations. So we needed the D train. Um, we couldn't find the platform for the D train. We decided to surface (oh good, I needed some air and sky!) and catch a cab the rest of the way to 79th Street at Central Park. When we first arrived at Central Park the rain and wind joined forces to make the prospect of walking in the park comically awful, but as we got a few minutes into our walk, the rain and wind mercifully stopped. Seriously, just stopped. Very decent of them! Highlights of our park explorations included: Belvedere Castle, Balcony Bridge, The Boathouse, The Rambles, Hans Christian Andersen Statue, Alice in Wonderland Statue, Dairy, Greywacke Arch, The Mall, and Wollman Rink where kids were actually ice skating. I'm glad we braved the rain, and even more glad the rain stopped for a while! By the time we ran out of park to walk, we found ourselves at Broadway very near a subway stop that took us within a block of the hotel. Soggy and spent, we retired to our room for the aforementioned greasy room service meal from The Breslin and some James Bond movies on BBC America. Crazy night in Manhattan, huh? That's how we roll. Tune in tomorrow for more soggy adventures on our last full day in New York. Our second full day in Manhattan featured mostly sunny skies with cold temperatures and whipping winds. The vacation sleeping schedule (I do love sleep!) meant a late start to our SoHo shopping date. Chad and I were both weary of motion-sickness from the cab rides: racing up to traffic lights or traffic to lurch forward when the brakes engage, weaving in and out of dangerously tiny gaps in traffic, the overpowering unnatural smell of various deodorizers. However, I have a mild phobia about being underground or in confined spaces, so I dared not take the subway on previous visits to New York. (I'm fine with the elevated trains in Chicago and monorails in Orlando or Atlanta, but there's something unsettling for me about being underground.) I swallowed my fear and allowed Chad to educate me in the ways of subway travel. My first New York subway experience was easy-peasy, surprisingly clean and comfortable. The trip cost almost as much as a cab ride for short distances ($2.25 each person), but without the motion-sickness proved itself a bargain. We caught the train one block from our hotel at 28th Street & Broadway and emerged on Prince Street in the heart of the SoHo shopping scene. The streets were crowded with college students and fellow-tourists gawking and gaping at storefronts. I was disappointed in Topshop, a British import of supposedly affordable high fashion, which seemed to me like an overpriced Forever 21 type of store. The lines for fitting rooms were ten people long, so no purchase. I loved returning to Pearl River Mart to buy Lychee Tea, cute chopsticks and Asian candies. Pearl River Mart tightly packs an amazing array of goods from fabrics to tea to lamps to 40-foot-long parade dragons into a large, multi-level space. Shopping there would have been overwhelming if we hadn't stepped up to the elevated tea room for a hot pot of tea. We got a bird's eye view of the main floor of the store while relaxing for a few minutes away from the crowds. Other stores worth a mention: CB2 - love the catalogs, enjoyed being able to touch-test the rug I want to order; Muji - meticulously edited selection of travel and home goods including travel-sized containers, essential oils, socks, t-shirts without printing on them, tasteful skyline cut-out souvenirs and more; Kid Robot - fun, alt-pop-art collectibles that the cool kids like. We ate late lunch/early dinner at Red Bamboo near the university area. Thank goodness for a vegetarian restaurant, but the focus here was on fake meat shaped out of soy, seitan & tempeh, while I prefer a more vegetable and whole bean approach to veggie dining. I enjoyed another easy subway ride to the hotel to get dressed-up for the night's Broadway show. Indulge me for a moment as I pass judgement on people who wear hiking boots and grubby jeans with fleece to a night at the theater. I opine that Broadway & off-Broadway shows warrant (at least) a nice, clean, dark pair of denim and dressy shoes perhaps a shirt with a collar or merino wool sweater on top. You're in no danger of being pulled into a mosh pit or being splattered in mud from monster trucks, so lose the lumberjack look. When Chad & I approached our mezzanine seats for the show, I sensed someone staring at me, then heard Chad exclaim, "Wow! What are you doing here?" The man seated directly behind us was Charles K., the coolest accountant I know, from Austin who happened to be in Manhattan for work and happened to score tickets to the same show. Small world! I held such high hopes for Promises, Promises starring Sean Hayes (who I adore) and Kristin Chenoweth (what's not to love?) based on one of my favorite movies ever - The Apartment. Sean Hayes grabbed my attention anytime he was on stage and Kristin Chenoweth packs mighty pipes into her pixie frame, but overall, I found the Burt Bacharach music rather tuneless, the dance numbers trite and the lighting design distracting. Katie Finneran as Marge MacDougall offered an unexpected bright spot in the show with her funny owl noises and shimmies that brought true humanity and humor to her character. Perhaps I should admit to myself that I don't like musicals unless they're poking fun at the random song outbursts in a self-aware, winking manner. Perhaps the combination of high ticket prices, star-power and love of The Apartment script set my expectations at an unreachable high. Overall the show felt flat. Upon returning to our super-hip hotel via subway, we made our way past the bouncers to the lobby for some dessert and bubbly drinks. The dimly-lit scene with its too loud music filled with highly-preened people felt silly and self-conscious like a high school dance. People tried to shout witty banter at each other in varied attempts at wooing. I felt like Chad & I were the only couple at a cheesy singles night event. Tune in tomorrow for weather woes / what to do when it rains on your vacation parade. After limited lackluster debate about where to go for vacation, we decided on New York City. (Marfa, Palm Springs and Washington D.C. were also vacation destination contenders.) Despite Chad's way-too-frequent trips to Manhattan for his old job, he didn't really get to explore the city much or do many tourist activities. Despite my few previous trips to Manhattan, I knew there was more to see and experience in the vibrant city. I scored an amazing hotel deal on Travelzoo at a tragically hip new hotel, The Ace Hotel NYC. Chad overheard one patron accurately describe it as, "upscale dorm living, but the scene in the lobby can be a bit much on the weekends." When we arrived at the hotel to check-in, we were greeted by a velvet rope and two handsome bouncers who directed us to the hotel's desk. A booming bass stereo was thumping so loudly, I could barely hear the desk clerk. She informed us that there was a fashion show going on in the lobby (Ann Taylor Spring and Summer Preview) and a DJ spinning later. You can read Glamour magazine's bit about Rachel Bilson at the fashion show and Lucky magazine's blog about the hotel's hipster ambiance. Once we got up to our interior courtyard room on the seventh floor the noise dissipated and the small room was perfectly appointed with the essentials, including a large bathroom. We were too late to get dinner at the Shake Shack nearby, but found our way over to Toon Thai at 435 Park Avenue South for the most delicious Thai food I've ever had. With full tummies, we returned to the hotel just as the rain started. Trying to sleep that night was a bit rough. Our interior courtyard room was pretty quiet, but we struggled to find the right balance between opening the window and running the overzealous heater. The air coming in from the window reeked of cooking pork fat thanks to the not-so-yummy meatcentric restaurant, The Breslin. I'll skip ahead and tell you that we ate room service from The Breslin one night, and did not like it. Chad quipped that the "salad" which was nothing more than bitter lettuce swimming in oil was proof of the restaurant's "contempt for vegetable-eaters". I'll sum it up with: greasy, gross, skip it. Bear in mind that I'm a vegetarian who values her health, and doesn't think of butter as a food group unto itself, but if you like fatty meat and butter, you might like The Breslin. Anyway, our first full day in Manhattan was bracingly cold and windy. We decided to take a cab up to The Museum of Natural History. The giant museum packs really interesting exhibits into an overwhelmingly large space. We cruised through charming, almost cozy-looking, life-size dioramas of Asian culture, Native Americas Culture, birds of many climates and then up to the dinosaur bones and fossils. The museum had so much more to see, but after nearly four hours, we were tired. We cabbed it back to Madison Square Park to eat at Shake Shack. I had the sinfully-fatty and delicious vegetarian shroom burger with fries and stole a few bites of Chad's Concrete frozen custard yummy thing. The meal was dangerously good and totally worth huddling under an outdoor heater to dine in the cold but pretty park. We walked a few blocks back to the Ace Hotel to get ready for our show, The 39 Steps. We had front row center seats, which I didn't realize when I bought the tickets, but I'm so glad. The 39 Steps cast delivered the most hilarious, best performed show I've ever seen! Four actors play multiple parts and simulate many different scenes with deceptive ease. If you are in Manhattan, this is THE show to see, friends. My face was sore from smiling and laughing so much! After the motion-sick-inducing cab rides thus far on our trip, Chad and I opted to walk the twenty-one blocks back up Broadway in the cold to our hotel. Tune in tomorrow for more, including how I learned to love New York subways. 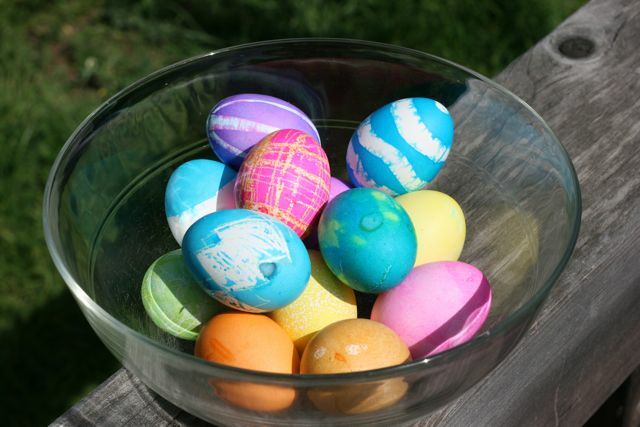 Chad pontificated that dying Easter eggs in the spring is similar to carving pumpkins in the fall: it's a creative task that sometimes doesn't turn out like you thought it would, the weather is great, and you're anticipating fun.